Tips from Dramatica Users - "Avoid getting lost in Storyweaving"
"Avoid getting lost in Storyweaving"
Subject: The answer to all your troubles-2. I promised to write about weaving and the "I always fold at Storyweaving" syndrome, but didn't deliver. I'm gonna do that right now. Sad, but true. 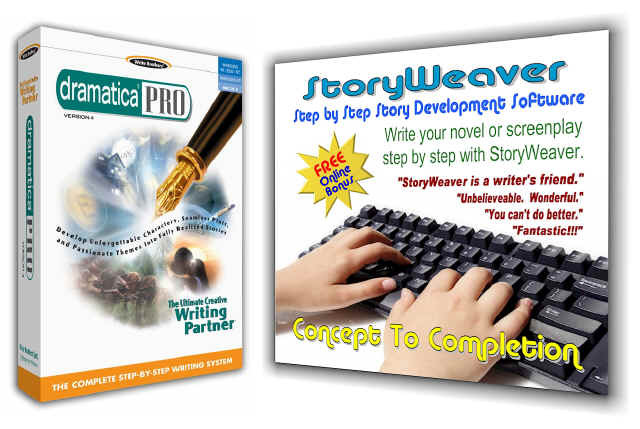 The Dramatica software can't write the story for you. At one moment, reading the reports, you feel as if you had all the story at your fingertips. You start encoding -maybe falling victim of the "encoding the same idea over and over" syndrome- and when you arrive at Storyweaving, you fold. That sure happened to me a lot. Because Dramatica was designed to serve to a broad band of formats, genres and media. The Storyweaving section of the Storyguide provides techniques and tips that adapt to all formats/genres. But evidently, you cannot finish a decent story without all the parameters of the format/genre you're working in. I remember the first time I used Dramatica to write a sitcom episode. I've been working in the sitcom format for the past year. Then I got a period of rest in which I studied Dramatica, practice writing some stories without format (somewhere in my mind I told myself these were going to be movie screenplays, a format I don't know well) and fold at Storyweaving each and every time. About three months ago, a producer calleld me and told me to write him a pilot for a sitcom series, I decided to give Dramatica a try. Three days later, with one of the best stories I have written ever, I began writing the teleplay itself, I was amazed: "This theory and software was designated specifically for sitcoms and and sitcoms only. I don't know why they say it's for all genres, the acts, the scenes, the dialog, it's all here!" Later I realized, I knew what I was doing when writing a sitcom. I knew where all the entrances and exits must be, I knew how long a dialog must be and I knew where all the commercials go. Dramatica only gave me a sound, balanced structure (well, that's all they've promised to give me). And I had to write the story myself. Bottomline: Don't constrict yourself to your 28 Storyguide scenes. Storyweaving is where you put all your previous ideas along with the Storyguide scenes. Now is when you can pull out that scene of "the action hero pulling out his machine gun and entering the ladies room by mistake" you always liked; here is the place to bring out all the Plot Points, all the High Point Commercial breaks, all the Comic Relief scenes, the High Speed chases, the Super Costly Special Effects scenes that everyone will remember... but are now within a sound storyform that will give coherence to your story. Are you reading this, Mr. Schwartzennegger? How you do it? How do you turn an encoded storyform into a multibillion production script, platinum bestseller or comedy hit that gets all the Nielsens? Trite but true: Practice. When Storyweaving use everything you know, use all your craft, your experience, your talent, your inspiration. Put your Dramatica apreciations on 3x5 cards and develop a scene for each one, "Step out" your Storyweaving scenes, get a book or two on the media you want to work on; try and practice in a format and a genre that you really love, one that you have seen all the movies, read all the books, watched all the specials. Don't be afraid to steal an idea or two from your favorite movie and putting into your story just to see how they work (after all, it's only practice, isn't it?) Don't throw away the stories that didn't work, you'll be amazed how many times you'll say "an idea from that piece of garbage I wrote two years ago was the idea for the first script I sold". In the end, you'll have to find out what works for you. But that has been the same with all the writers throughout history. Here's some of the stuff that works for me: I encode each Plot Progression scene as an event, a single story moment that is significant; also I try to throw in the encoding facts from the throughline: if it's action or decision, if the character changes or remains steadfast, and finally I try to look at each Plot Progression scene as a Plot Point (in the traditional sense: a point where the direction of the plot turns). This sounds complicated, but I order each of the things above into a sentence, like: "An Action of Obtaining gives direction and something to do to our Objective Characters" or "A Decision from the Past to the Present changes the life of the Main Character" This makes encoding a single event extra easy, in the first example it could be the theft of an historic object, on the second example it could be that the violent ex-husband decides to visit the Main Character. So, I write my 28 Storyguide Plot Progression scenes in 3x5 cards and I set them up in a big corkboard so I can see all my story at once. Next I write in additional 3x5 cards each thematic scene, character moment and Appreciation that's supposed to go with that particular Plot Progression scene. I don't write them in the same card (as the Storyguide suggests) because I haven't decided still if I want to develop that particular item as a piece of dialog, as an event or as a complete scene, so I just tack this cards next to their corresponding scene. Now, to go from the old family house-diary event to the cocktail lounge I review all the apreciations, character moments, and thematic scenes that I have on the additional cards. That makes some kind of a private brainstorm and maybe then I know: The skeptic/sidekick active conflict will take me to the cocktail lounge on San Francisco, or maybe it will be the obtaining stipulation, or maybe them two, one after the other, or all of them or even none of the above. Then I'll have to develop all that Appreciation and stuff as dialog, events and additional scenes. Bottomline: all this is dictated by the parameters of the format/genre I'm working in. So, that's some stuff that has worked for me. Maybe it could also work for you. As always, please forgive my language-gap errors.